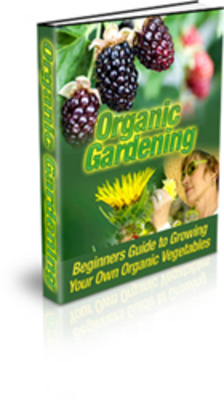 Once you have this guide to growing your own organic vegetables you will be able to start your own organic vegetable garden as soon as you have finished reading it. The e-book will tell you which vegetables can be planted throughout the year and which plants will produce multiple crops saving you time, space, and money. When you are able to grow your vegetables organically you will have a way to save your family a great deal of time and money. Any vegetable you grow with the help of this guide will be one less vegetable you have to pay for when grocery shopping. You will be eating healthy organic vegetables while saving money! Sure you can try to garden organically but without the help of this e-book do you really want to waste time and money on the wrong seeds and supplies? Not only will this e-book tell you exactly what types of seeds you should purchase to help avoid diseases and insect infestations. The e-book will also tell you ways to create your own fertilizers with household supplies and ways to efficiently plant, weed, and care for your new organic garden that you would only discover through trial and expensive error. If you are someone that already has a vegetable garden but has not been growing organically this guide will help you save money too. Think of all the money you spend each month on pesticides, insecticides, fungus killers, and weed killers. Now imagine never having to purchase those things again! With organic vegetable growing you are only using natural ingredients that can be prepared in your own home without additional costs. For only $17 you will be able to start saving your family and friends money each and every month by providing them with fresh, delicious organic vegetables straight from your own garden. Now you will be able to create fresh salads from tomatoes, lettuce, and cucumbers that you have grown yourself with organic vegetables. Plus you will be in total control of everything that is used to grow your vegetables so you no longer have to worry about what chemicals you and your family may or may not be ingesting with each meal. In addition to growing vegetables for your own family organically and eliminating various expensive items from your monthly shopping list, you are also creating a new income generator. How much do you think your friends, neighbors, and co-workers will pay for your delicious, organically grown vegetables? Even if you charge less than your local grocery store for your organic vegetables you will still be able to make a tidy profit. For only $17 you are creating a new source of income for your entire family that could more than pay for the cost of seeds and any other inexpensive supplies you might have purchased to help set up your organic garden. If you're not totally thrilled with "Organic Gardening for Beginners" for whatever reason at all, simply send me an email and I'll cheerfully refund 100% your money with the click of a button. P.S. Remember when I told you about growing organic vegetables creating another source of income for yourself and your family? This e-book will tell you what vegetables can be planted that will produce multiple crops throughout the year without any replanting. It will also tell you how to properly care for these plants to ensure production continues throughout the year. Organic Vegetable Gardening gardening;organic gardening 99106290 21.00 janetcombs Fresh Download Available!